Backyard Travel, the online boutique tour operator specializing in insider tours throughout Asia, today announced a new short tour highlighting the wonders of Monywa, Myanmar. This small town in the Sagaing Region is home to several spectacular religious sites, and the 2-day, 1-night Archeological Quest in Monywa Tour gives travelers a close-up look at these little-known historical treasures. 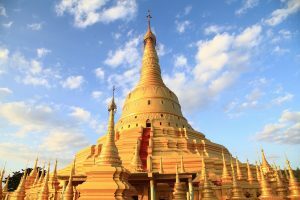 Embarking from Mandalay, 140 kilometers east of Monywa, travelers pass through peaceful rural scenery before arriving at the incredible Thanboddhay Pagoda. Here, they’ll have time to explore a temple complex with more than half a million Buddha images adorning the walls, ceilings and alcoves. At Botahtaung Pagoda, they’ll next see the country’s largest reclining Buddha statue, 100 meters in length, before heading into Monywa to observe some artisans at work at Kyaukka Lacquerware Village. For more information about the Archaeological Quest in Monywa Tour, contact Pete at marketing@backyardtravel.com.